We have placed a new parts search tool on the Hobie Cat website to help assist in finding and viewing Hobie Cat parts and accessories. A link to the search tool is also located on the Accessories tab of the website. 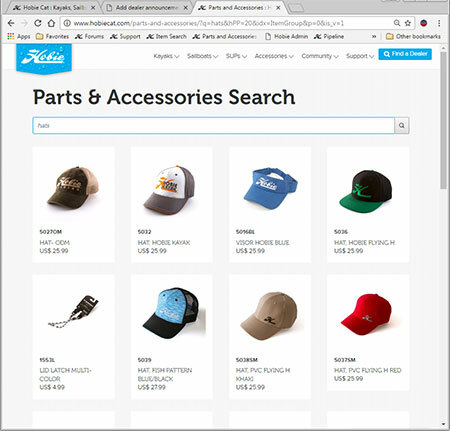 Use this tool to lookup parts and accessories by part number, partial part number, descriptions or key words. The system will also show items with similar numbering or spelling, so if even you get close... it should find it! The system will begin filling matched items as soon as you start typing. This will be great to help look up parts in the catalog’s parts diagrams and then confirm that this is what you wanted by viewing an image of it using the tool. Data for this tool is live, so constantly updated. New parts will show up when activated in our system. Discontinued items drop off once inventory is depleted. This means you can look up discontinued items too… if the item shows… we may still have the item in stock! We are still fine tuning and plan to make changes and additions, but give it a try! Try searching for hats, shirts, hoodies or towels! These are a few of the recently added items that will appear in new Catalogs coming out soon!